Our focus is your focus - to secure the exam results you need to move on to a top university or entry to the profession of your choice - this is our commitment to academic achievement, a valuable part of our unique 'LAE experience'. Our most recent, record-breaking results saw even more students achieving the very best grades needed to gain places at the country’s top universities. 99% of all grades were A*- C, a true reflection of the inclusive levels of attainment at LAE. For value added, LAE ranked in the top 1% of schools and sixth form colleges for the fourth year running. LAE is proud to be part of the excellent A level provision on offer in Newham. Our students strive to gain the very best grades and LAE is one of the very best places to achieve this. Learn more about our commitment to the very highest academic achievement as part of 'The LAE Experience'. Each year, the performance of the academy's students as a whole is reported in the Department for Education (DfE) school performance tables. We are delighted to report the latest results show that LAE is one of the best performing schools in the country, in the top 5% nationally for student progress. This figure shows you how much progress our students have made since joining LAE compared with similar students nationally. A figure of +0.44 means our students' levels of progress are well above national average, levels of progress that put LAE in the top 5% of schools nationally. In real terms this means our students' achieve A level results that are around half a grade better than an average school in England. 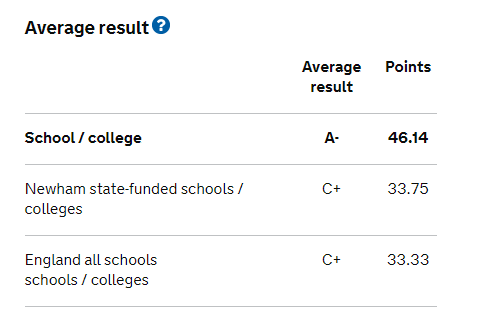 Introduced last year by the DfE, the average A level grade our students achieve is: A- compared with C+ for both Newham and nationally. Mirroring the outstanding levels of progress our students make, the overall levels of attainment are equally impressive and something we are equally proud of. Our Average Point Score (APS) per entry, L3 value added score, and percentage of students achieving AAB in 2+ facilitating subjects puts us in the top 1% of sixth forms. 98% of students who left LAE Stratford in 2018 progressed to Higher Education, employment or a gap year prior to university. The overall percentage of students who enrolled at LAE Stratford and subsequently completed their two year A level study programme in 2018 was 95%.